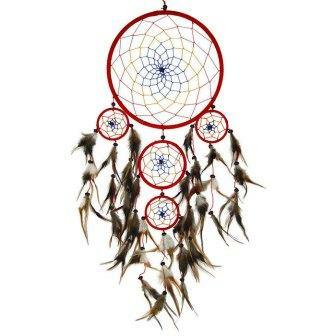 This eye catching dreamcatcher has five webs in total which have been tightly wrapped in red cord and decorated with multi-colored webbing, beads and natural brown feathers. It is said that Dreamcatchers are an ancient spiritual tool used to protect the sleeper from bad dreams. A dreamcatcher should be hung over the place you sleep so the web can catch your bad dreams and allow the good ones to glide down from the feathers and into your head. Measures Approximately 22" x 8.5"